This interview is part of a series where Marginal Revolution University speaks with educators and thought leaders about how to teach economics and other subjects in today’s classroom. The reasons social media works with economics are the diverse topics and because it develops curiosity. Students need curiosity to succeed in economics. Abdullah Al-Bahrani is an assistant professor of economics at Northern Kentucky University, Darshak Patel is a lecturer of economics at the University of Kentucky, and Brandon Sheridan is an assistant professor of economics at North Central College. MRU: How has teaching economics changed since you were a student? AL-BAHRANI: Digital media wasn’t available when I was doing my undergrad at the University of Louisville in 2002. Mobile info wasn’t accessible. Now, you are competing with a lot of different things for students’ attention. My teaching style now revolves around breaking up lectures into smaller pieces. When I was an undergraduate, if you got distracted, it was just by your thoughts. Now it’s social media, emails, texts, etc. Classes need to be more dynamic. PATEL: There was a huge disconnect when I was in undergrad between students and professors. Technology has helped to fill that gap. MRU: What are your thoughts on banning technology in classroom? AL-BAHRANI: We are economists. Freedom of choice is part of our study! Once you give students full information [on whether to use technology to take notes], they decide what’s best for them. I have a policy, though, that if a phone rings during class, I have the right to answer it. MRU: What ways have you incorporated online materials? PATEL: Videos, movies, TV shows like The Simpsons, Seinfeld, ESPN, Shark Tank, etc. MRU: Your paper focuses on the use of social media in economics classrooms. Do you think there’s something about economics that makes it especially open to social media use? If so, why? SHERIDAN: I don’t think there’s anything specific to economics that lends itself to social media. The reason we focus on economics is simply because that’s what we teach. The nice thing about economics, though, is that you have a lot of current events to draw from, and economic examples span all sorts of interests and ranges. AL-BAHRANI: The reasons social media works with economics are the diverse topics and because it develops curiosity. Students need curiosity to succeed in economics. PATEL: Economics is actually lagging behind other disciplines when it comes to adopting new technologies—like information systems and marketing, for instance. MRU: Why are economics educators lagging in using technology in the classroom? PATEL: Opportunity cost. Why should we change? Professors are familiar with one way of teaching, but students are always going to be changing. If faculty don’t change, we won’t keep up with the students. AL-BAHRANI: It’s the culture throughout graduate schools for economics educators. Why change from a focus on research? It’s acceptable now to teach in a new and innovative way. This does not mean we’re diluting the content. There’s so much content to cover at the principles level. These innovative methods are now used to complement teaching this content. The acceptance of using technology in the classroom has really developed over the past 10 years. SHERIDAN: This idea of using technology in the classroom is gaining momentum. Like Abdullah said, it’s taken off in the last 5-10 years. Economics professors have been experimenting with it for a while now. MRU: What are some examples of how social media is being used in the classroom? PATEL: I connect with students in and out of class. Why does learning have to be restricted to a classroom model? Why can’t we have continuous learning? Any experience is relevant to economics. As a professor, I use Twitter to microblog about videos, and articles. I ask students to also microblog about articles on Twitter. The unique thing about Twitter is that the 140-character restriction helps students think about reducing the content and being more specific when sharing ideas. AL-BAHRANI: I have used “economics selfies,” which encourage students to be active learners. They post images from their everyday life and share the economics behind that image. These images end up being great examples of economics all around us, and you can use them to share with future classes and students -- “Hey, a student last semester shared this example of economics in their life…” Another example of how I’ve used social media is, in the spring, my macroeconomics class live tweets the State of the Union address. I ask them to use a class hashtag based on SOTU content, which later becomes the basis for classroom discussion. SHERIDAN: I’ve got a lot of examples off Twitter. Type in a hashtag with an economics concept, like “opportunity cost,” and see how other professors or students are using that hashtag to communicate. This gives me ideas for discussion and examples to share with my students. MRU: Are there certain economic principles that are expressed especially well through social media? AL-BAHRANI: A lot of examples that explain prices, shifts in supply and demand curves, etc. But I recommend avoiding narrowing students’ focus to economics concepts. The reason we use social media is to increase engagement, discussion, and co-sharing of ideas. It’s less about economics specifically, and more about asking questions and having a discussion. As a professor, I also share the curiosity I have—why did prices go up? I tweet about it. Students form a hypothesis and then we all have a discussion in the classroom. The professor simply becomes someone that is learning with them. PATEL: Engagement doesn’t stop at end of semester this way. Students still engage with professors about economics in the summer. The learning continues even when the semester is over. I still interacted with students over the summer on Twitter when they encountered economics in their everyday life. MRU: How does social media change students’ relationships with professors? Of the platforms you’ve researched, which benefit the professor-student relationship the most? SHERIDAN: Social media makes us more approachable. In more traditional teaching models, students come to class and hear us talk, and we talk to them again during office hours. They’re very formal interactions. Social media is more casual. If they see us online, we can have a conversation in real-time. It makes us more approachable. AL-BAHRANI: The biggest benefit I see is that social media allows students to start a discussion with the professor anytime without waiting for him or her to teach the content. They’re more willing to express curiosity and let you know when they don’t understand something. If they see something, they can just ask. In-person office hours attendance is on the rise now too because professors on social media seem more approachable. MRU: In the ESPN paper by Patel and Al-Bahrani, you emphasize the importance of active learning. Can you explain exactly what you mean by this concept, and what are some examples educators can incorporate in their classrooms? AL-BAHRANI: Active learning is not a new idea. It started ten years ago in the movement to reform economics education. With it, students become active participants in the learning process. It’s discussion-based teaching. SHERIDAN: Active learning makes the students more a part of the process. In upper level classes, we do a lot of cooperative learning (i.e. group work). MRU: What is it about sports that can spark economics discussion? Are there other topics you think are ripe for extracting economics lessons? AL-BAHRANI: While 30 for 30 (the sports documentary series used in the paper) is an ESPN product, sports is in the background. Most ESPN documentaries have to do with history or social events, and economics is always in play. For instance, The Two Escobars, a documentary focusing on Colombia’s issues with crime and drugs, has a lot more economics than discussion of sports. The documentary highlights a social and cultural problem – sports is only part of the picture. Yes, watching the video is a passive part, but we then tell students to think about where economic concepts show up in the narrative. Students then show an active effort to find economic content in the documentary and will usually find more connections than you had originally thought about! Then you come back to class and start the active discussion on what they observed. MRU: In general, which other shows or films particularly lend themselves to teaching economics? SHERIDAN: The Economics of Seinfeld was one of the first to come out. Another was on the TV show The Office. But it’s really about what the students are watching right now. 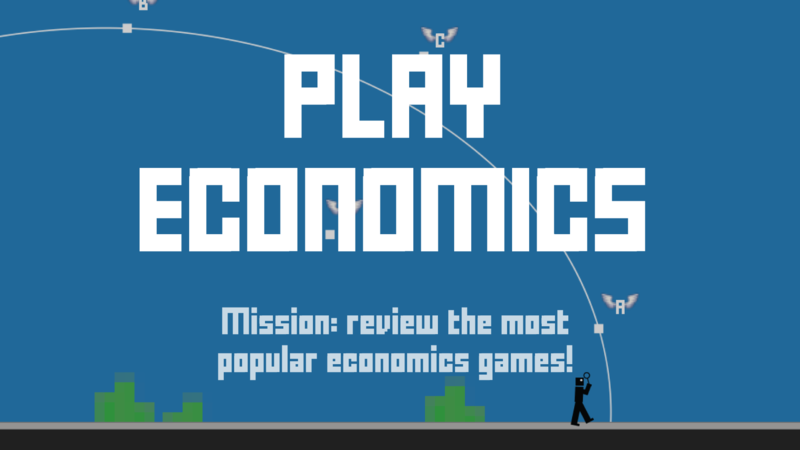 We believe economics is everywhere; it doesn’t matter the show. Just show what the students are already interested in and point out examples of economics. AL-BAHRANI: I’m collecting shows students watch and comparing to the resources available. What students are watching might be different than what resources are already out there. The key is to go to where students already are; they’ll be more engaged that way. These teacher resources were made possible by feedback and contributions from educators like you.